Circle K representatives visited Akron Children’s in December to present a check for $87,500 from the convenience retailer’s charity golf outing. Pictured from left are: Elizabeth Smith, human resources director; Jack Wiolland, category manager; Jeff Beight, director of marketing; Akron Children’s CMN Program Manager, Nicci Avalon; and Clint Blunier, category manager. Since 2000, Circle K stores in the Great Lakes Division have made a difference in the lives of patients at Children’s Miracle Network (CMN) Hospitals. 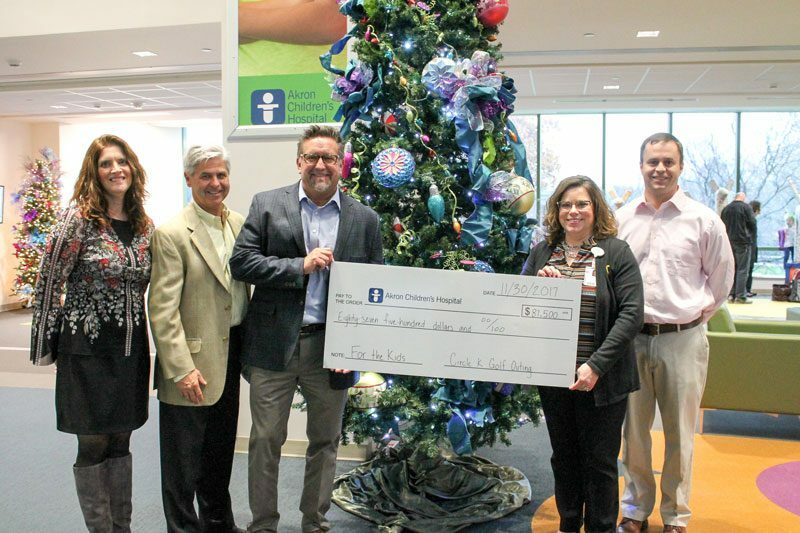 Between a large-scale golf outing at three courses in Uniontown, Ohio to grassroot campaigns, the convenience retailer has donated $1 million to Akron Children’s Hospital over four years. Circle K has hosted a golf outing for more than 11 years to raise money for charities in communities where it operates. More than 400 golfers participate in this annual outing at Prestwick, Raintree and Mayfair country clubs, which includes a reception, silent auction and dinner. It also includes visits from local professional athletes. Since its inception in 2007, the event has raised $4.5 million. Last year, the event raised $502,000 for local charities, including $87,500 for Akron Children’s. Each April, Circle K employees and their customers enthusiastically support CMN Hospitals through its annual Miracle Balloon campaign. Cashiers collect $1 at checkout for balloon icons displayed throughout each store. Funds are distributed to local children’s hospitals based on a store’s location. In 2017 alone, Circle K collected $163,070 for Akron Children’s. These initiatives are personal to Smith and many others in the Circle K family, who have not only contributed but have also been helped personally by Akron Children’s and its staff. Visit your local Circle K stores now through May 13 to donate to the balloon icon campaign benefiting Akron Children’s Hospital.